(Newser) – The salmonella outbreak that has sickened almost 300 people in 18 states appears to involve much tougher strains of the disease than usual, according to some of the few Centers for Disease Control and Prevention workers still on the job. The illness, traced to raw chicken from California, has put at least 42% of the victims in the hospital, more than double the proportion in previous salmonella outbreaks, and the strains are proving resistant to multiple kinds of antibiotics. The outbreak hasn't killed anybody yet, but almost a third of those hospitalized have salmonella septicemia—a potentially deadly whole-body inflammation. 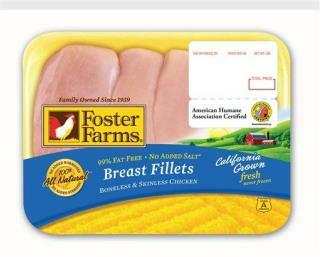 I eat Foster Farms chicken all the time. Have never gotten sick from eating it & I do all my own cooking. The trick to dealing with chicken in order to avoid getting sick from Salmonella is, cook it. Don't store it in containers in the fridge for a week & then try to cook it quickly at too low a cooking temp, cook it fairly soon after you buy it at a high enough temp to kill the nasty bugs & whatever you don't eat, put in the fridge right away after you eat it. Oh & make sure to wash cooking utensils & pots you used to store the chicken before you cooked it in hot soapy dishwater, or in a dishwasher. I've been eating Foster Farms chicken since, geez, 1990s maybe? They're here in California in the Central Valley & they don't feed their chickens steroids or antibiotics or inject them with salt-water to thicken the meat up, it's just good, decent quality chicken that doesn't cause me any problems after I cook it & eat it. Good stuff, if you cook it properly ?? Google probably knows more about the outbreak than CDC. Its based on people entering symptoms into search queries. Their software tracks patterns of outbreaks. Then it sends results to CDC. Of course this week it got back the reply many of us have got from an agency, "delivery error, destination does not exist in the directory listing of the server." Knowing how hateful the Obama gang is to prove their point I wouldn't be surprised Obama's gang had some of the chicken shipment tainted with the samonella.